Longmans have launched the first of a six-volume History of Ireland with a synthesis of the last twenty years of Early Christian scholarship. It is an uneven book, relying for source material primarily on Latin manuscripts, and while it is hardly a serious setback for the progress of early Irish historical studies, it is not the book the reader had a right to expect given its title and its position as part of a new multi-volume history of Ireland. The book’s most valuable contributions are on the Early Christian church. Ó Cróinín tells the remarkable story of Patrick, ‘the only citizen of the Roman Empire made a slave who lived to tell the tale’. Patrick emerges as an even more unusual figure in Irish history when we learn that the Christian church of his day was not a missionary one. Neither was the early church tolerant of other gods, and the author repudiates the facile notion that the Early Christian church in Ireland easily subsumed pagan practice into its own ceremony. According to the author, the Irish church began with an organisation based on the European model of dioceses and bishops but by AD 600 it had become the monastic church that it was to remain until the coming of the Normans. This does not mean, however, that it lacked organisation as the church consolidated its power by establishing hereditary control of church lands and held a series of synods which regulated religious affairs throughout Ireland. Neither does it mean that the Irish were antagonistic towards Rome: despite Irish development along monastic lines, Rome remained the ‘chief of cities’ and the Pope was consulted in controversial cases regarding religious practice. Ó Cróinín poses the question; did the Irish really carry the torch of learning to Europe in the seventh to ninth centuries? And while he never directly answers this question, the churchmen who went to Europe and those who stayed at home, certainly achieved a remarkable standard of knowledge. Only a century after the introduction of Christianity to Ireland, the monastic schools were producing Latin often better than anything found in Europe. A letter written by St Cummian in AD 633 included excerpts from over forty separate texts! The Hiberno-Latin texts of this period clearly constitute Ireland’s Golden Age for Ó Cróinín, although he excludes the ‘dismal swamp of superstition and perverted Christianity’ contained in the Lives of the Saints. And while his masterly summary of these Hiberno-Latin sources marks the freshest part of this book, it would give a one-sided view of Early Christian Ireland to a university student with no previous knowledge of Irish history (the purported target audience for this series). Clearly it was a Golden Age of ideas, but there is scant mention of other essential aspects of this flowering of Irish civilisation; the supreme artistry and craftsmanship which produced works like the Book of Kells, Derrynaflan hoard and the Tara brooch are overlooked. The section on the Viking contribution to Irish craftsmanship, while worthwhile, brings into sharper contrast his failure to discuss the Golden Age of Irish art. Although this is a history volume, I would expect that those readers seeking just that would be the most disappointed. 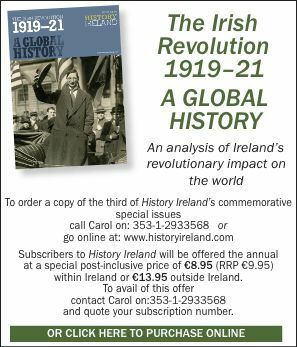 The narrative history of Ireland is summarised in chapters comprising about one-quarter of the book and these are acknowledged by the author to owe a great deal to the earlier work of Mac Niocaill, Ó Corráin (in the Gill History of Ireland) and F.J. Byrne. Other readers, who share with this reviewer the belief that history is not just about texts but about people, will find the chapter on land, settlement and economy to be the book’s weakest. The chapter is based mostly on the laws and Lives of the Saints (which makes for wonderful reading) and refers on occasion to the masterly work of Frank Mitchell, but Ó Cróinín almost entirely ignores recent contributions to the archaeology, sociology, historical geography and environmental history of Early Christian Ireland. The book’s key fault is signalled in the author’s preface when he admits that none of his colleagues had seen a draft of the book. This is a staggering admission from one who, in a recent review, points out that ‘the ideal situation will have been reached when all disciplines combine and collaborate in the joint task of making sense of the past’. This lack of collaboration makes for some startling omissions in fields outside the author’s own expertise. The excavations in Viking Dublin are mentioned but recent discoveries in Waterford and Wexford are overlooked. The links between the houses in Early Irish law and those uncovered in Chris Lynn’s Deer Park Farms excavation are noted but other attempts to link early sources with physical evidence are ignored. Perhaps the author is right when he points out that ‘pollen analysis is almost entirely absent from the archaeological evidence’ if by this he means that many archaeological reports lack a discussion of a site’s environment, but pollen analysis is in fact producing some of the most exciting information available on the Early Christian period. It is ironic that much of this ground-breaking work has been carried out by Michael O’Connell in Ó Cróinín’s own university (UCG) where consultation should have been straightforward. The environmental record shows that developments in the period when Christianity was first introduced took place against a background of rapidly expanding population and agricultural innovation. The growth of the church was matched, therefore, and probably financed through this equally impressive but hidden economic expansion. The author’s neglect of what could be termed the historical geography of the period is mirrored in the inattention paid to geographical detail; Skerries and Lynally are said to be in County Meath, Clonard in Westmeath. The implications of the map of early ecclesiastical foundations mentioned in the Annals of Ulster are not addressed. Why are we given only the genealogical tables for the principal Leinster tribes? What does it all mean? On a more positive note, this book lacks the rancour which mars much research into early Irish history. It also takes a more balanced view regarding the origins of Early Christian institutions. While some have maintained that the formation of Early Irish law was the sole preserve of the church, Ó Cróinín points out that there is no evidence in Ireland for ecclesiastical collection and re-editing of early law, as was the case in seventh-century Spain where bishops had a place in court proceedings. The persistence of legally valid multiple-marriages, for example, demonstrates that the brehon lawyers were not entirely absorbed into the church system. There is also a welcome return to the view that texts of one period can be a valid source for earlier events; the Táin can in fact offer a ‘window on the Iron Age’ and tenth-century hagiography accurately portrays events which occurred five centuries before. The huge scope of the book, from the coming of St Patrick to the arrival of the Normans, is clearly too vast to be adequately covered. This is most evident in the final chapter—Ireland 1014-1200—in which the last section of the book, two pages entitled ‘Feudalisation in Ireland, c. 1000’ eloquently express the book’s shortcomings. For surely this dissuasion should be at the heart of debate about Ireland before the Normans. Here we are told, almost as an after-thought, that developments of kingship were not only post-Viking phenomena and that, from the ninth century, there was an increased use of terms which can be translated as ‘lord’ to describe former petty kings. Over-kings, who in an earlier period had no great powers, were now instigating new royal offices, were levying taxes, promulgating laws, endowing churches with lands by the instrument of written charters and granting and re-granting territories confiscated from defeated adversaries. Little is said about these developments and their possible bearing on early twelfth-century synods which began the process of church reform. No mention is made of the Cistercians, a new style of monastic order which, with the revival of the standard diocesan system introduced in the synods, demonstrates the modernisation of Irish society in the decades preceding the Norman invasion. If the Vikings did not shatter the ‘old order’, the reader has a right to expect some account of the processes which did lead to these profound changes. This is not the book I would have expected as the first volume of a new history of Ireland; indeed, it is probably not the book this noted authority on Hiberno-Latin texts wanted to write. But, while the author claims not to have enjoyed writing the book, I enjoyed reading it. It is clearly written throughout and events are consistently presented against the backdrop of European developments. Ó Cróinín lifts the gloom surrounding some previous work on Early Christian Ireland, depicting an island whose population lived in considerable comfort, where the institution of slavery and the slave economy remained largely alien to the Irish way of life, where bees were counted among the eight categories of livestock, and where there were more kings than anywhere else in contemporary Europe.